Another must-visit place when traveling to South Cotabato is Fortune Field Resort in the Municipality of Banga. The place is frequented by tourists for its Pantatan Restaurant which is known here and even outside the province for their specialties, different "pantat" or hito (catfish) dishes. I was able to visit Fortune Field Resort two weeks ago together with some bloggers from Manila and Cebu. The resort was one of the pit stop of the South Cotabato leg of the SOCCSKSARGEN Experience Tour for bloggers. We had our lunch at Pantatan Restaurant and tried some of their popular dishes. Our favorites were the Sinugbang Hito or grilled catfish which is their best seller, deep fried hito, and adobong hito. 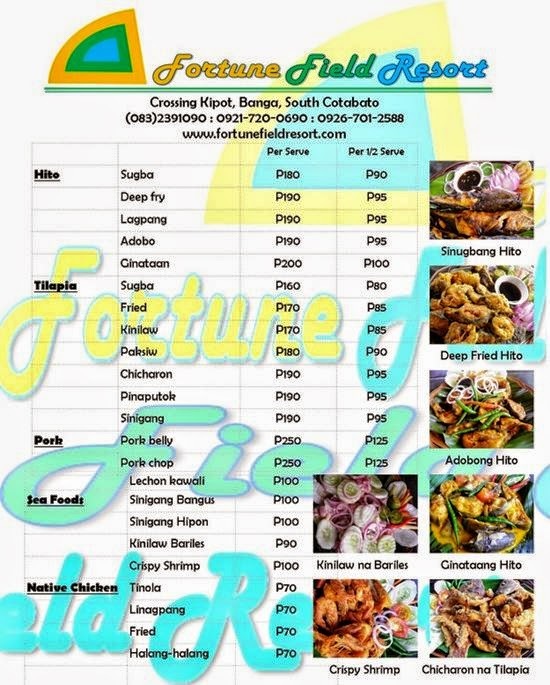 Aside from hito, Pantatan also has different tilapia dishes, pork, seafood and native chicken dishes on their menu all at very affordable prices. We also had a quick tour around the resort where a staff showed us their other amenities. 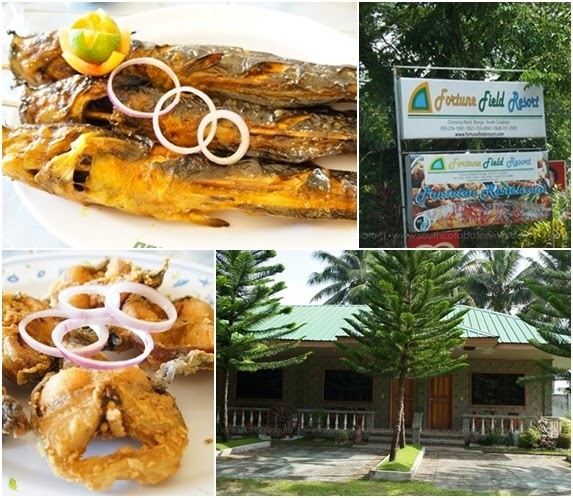 I was surprised upon learning that Fortune Field Resort has lodging facilities with very affordable rates. The resort also has function halls for different occassion, swimming pool and a scenic area called Triangle Lagoon. Villa Victoria at Fortune Field Resort. It has six (6) available rooms which we all find very spacious for a low rate of only P750.00 per night. Good for two persons. Each room has hot and cold shower, cable TV and own parking lot. Villa Sophia at Fortune Field Resort. Three (3) new rooms located near the pool area. Rooms are smaller compared to that of Villa Victoria but also has hot and cold shower, cable TV and are wifi hot spot. Very affordable for only PhP 650.00 per night good for 2 persons with free pool passes. Triangle Lagoon at Fortune Field Resort. This area in the resort is ideal for a romantic wedding proposal, for photo shoot for prenup, or for lagoon wedding venue. Fortune Field Resort is located at Crossing Kipot, Banga, South Cotabato.